Proform is one of the best fitness brands in the home exercise equipment industry. They’re at the cutting edge of technology and are a noted leader in the development of home elliptical machines. If you’re thinking about getting an elliptical to use at home, Proform has a lot of great things to offer. One of the coolest features of all Proform elliptical trainers is the inclusion of iFit Technology right into their machines’ consoles. What exactly is iFit? It’s a technology that remotely brings trainers and coaches right into your home. You’ll participate in workouts taking place in exotic places around the world without ever leaving your living room. It also integrates Google Maps Street View so you can take a virtual walk through almost any location you can dream of. If you’re a subscriber to iFit, you’ll be happy to know that Proform elliptical machines are equipped to use this awesome, motivating technology. Of course, that’s not to say you need to use iFit to get a great workout from any of these machines. They’re all remarkable in their own right and bring a lot to the table. Each one is packed with features that will give you an amazing workout right in the comfort of your own home. Let’s take a look at some of the best models of elliptical exerciser Proform has to offer. One thing we love about the Smart Strider 735 is the space saving-design. If you’re looking for a rear-drive elliptical that isn’t going to take up all your floor space, this one is a great choice. The foot pedals are oversized and have decent traction. They feel great and really help you get a good grip on them. With just a touch of a console button, you can adjust the incline from 0 to 10 degrees to ramp up your workout. And get this: there are 20 different digital resistance levels to choose from. The console is also loaded with 22 different workout apps so you can vary your exercises and allows you access to iFit. It also has a port for your iPhone and speakers so you can listen to your own tunes as you work out. The commercial grade frame can hold up to 300 pounds and even has a place for a bottle of water. It’s like they’ve thought of everything. This is a really good choice for the money. It’s reliable, easy to use, and a really smart buy. 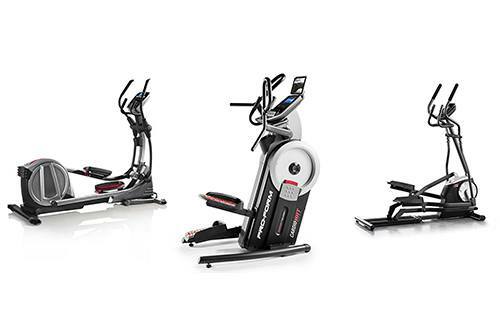 The ProForm Cardio HIIT Elliptical Trainer is a unique machine. It’s kind of a step machine and elliptical hybrid that gives you a high-intensity interval training (HIIT) workout with little impact. There is a lot of research out there that HIIT is a great way to increase the impact of your workout and build up your endurance to prepare for more intense workouts in the future. This machine is one of the few of its kind that offers you a chance to get an impactful HIIT workout from a piece of home workout equipment. One of the great things about this elliptical is the range of movement you get with your feet. They can go 10 inches vertically and 5 inches horizontally during workouts on this machine to burn even more calories. Looking to incorporate an upper body workout, too? Another great thing about this machine is it doesn’t just workout your legs. The handlebars are designed to give upper body resistance through boxing like motions. You can manipulate these handles in different ways and work everything from your arms to you back to your core. You can use this as a standard workout machine but the thing it was really designed to do is HIIT. It comes pre-programmed with 32 multiple HIIT routines plus the ability to download even more right to the console. There are also 24 different resistance settings so you can really vary your workouts as well as iFit capabilities. There are a lot of cool extra features, too. It can connect to your iPhone or iPod so you can listen to your favorite tunes on the speakers as you work out. There’s also an integrated tablet holder if you wanted to watch a movie or videos during your exercise. This machine is packed full of great features and would make a great addition to any home gym. If you’re looking for a standard elliptical that’s a solid piece of equipment and a good buy, check ProForm’s 150i. It has a front-drive design with a 17-inch stride that will give you a great workout. The oversized pedals are perfect for safe, solid footing. There are 12 different resistance levels to choose from ensuring your workouts will be smooth with the right amount of resistance. If you want to move it from room to room, the transport wheels make it really easy to do so. Plus, you can keep things nice and level even if the floor isn’t thanks to the adjustable level footing. The large LCD display lets you choose from 12 different workout apps and shows you how long you’ve been working out as well as your speed. Combine all this with iFit technology and you can see why it’s a great choice for your home workouts. Another awesome choice, if you’re looking for a rear drive elliptical trainer, is the Smart Strider 935. The thing we like the most about this one is the console. Its 7-inch, full-color display will take your iFit workouts to the next level. If you don’t have an iFit subscription, don’t worry. It also has an Android web browser and gives you a lot of opportunities to use other apps and videos while you exercise. It also has 30 pre-set workouts to get you going. With 24 different resistance levels and a power adjustable incline up to 10 degrees, this machine will give you an awesome in-home workout.